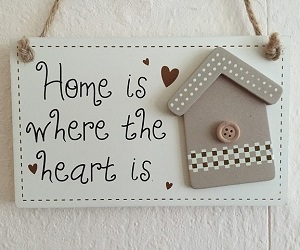 Whether you live in a small inner-city apartment or a seaside mansion, there really is no place like home. Perhaps the most important thing to keep in mind with any home improvement project is to make your home your own. The world is already full of perfect catalogue homes, what is often missing is personality and authenticity. While minimal clean lines are still very desirable and de-cluttering is as important as ever, the personal touch often gets lost when people are striving for domestic perfection. Personalisation is a key factor in making a good home great, because it creates a link between static environments and the people living inside them. An entire home can be designed around this concept, with professional interior designers often using a few meaningful personal objects as inspiration for large projects. A good reading chair, a desk, or even a guitar can all serve as a foundation, with furniture, lighting, and even colour selection all designed to complement a few objects that really matter. The personalisation of space also leads to improved functionality, especially when people make design choices based around their favourite activities and experiences. For example, instead of selecting colours and furniture based on arbitrary notions of style and fashion, you can choose a chair specifically for reading in or a colourful rug where you can play with your kids. While it's still important to choose stylish objects that follow a design narrative, by thinking like this, everything placed inside your home will be there for a well defined and important reason. In order to make a home truly great, it's also important to pay close attention to the little things. Even though they're small in size, it's the details and accents inside a home that make it really shine. By avoiding clutter and taking care of the little things, the larger space will not only feel more organised, it will also feel more loved. Depending on the context, a design accent can be anything from a splash of colour to a well selected light fixture or art piece. Small pieces that fit within a larger whole can give your entire home an air of refinement and integrity. The concept of flow also plays an important role in interior design, transforming static spaces into lived experiences. A home that flows well is simply a nice place to be, with different rooms and hallways designed to connect spaces together rather than keep them apart. Flow is also dependent on the outside environment, with landscaping always an important factor in truly great homes. Domestic flow can be improved without extensive renovations or landscaping, however, with simple furniture placement and even colour choices helping one room to flow into another. Truly great homes are more than bricks and mortar, they almost feel alive, and offer an experience that is both priceless and profound.